During the Troubles, as part of its armed campaign against British rule in Northern Ireland, the Provisional IRA had repeatedly used homemade mortars against targets in Northern Ireland. The most notable attack was the 1985 Newry mortar attack which killed nine members of the Royal Ulster Constabulary. The IRA had carried out many attacks in England, but had not used mortars there. In December 1988 items used in their construction and technical details regarding the weapon's trajectory were found during a raid in Battersea, South London by members of the Metropolitan Police Anti-Terrorist Branch. In the late 1980s, British Prime Minister Margaret Thatcher was top of the IRA's list for assassination, following the failed attempt on her life in the Brighton hotel bombing. Security around Downing Street had been stepped up at a cost of £800,000 following increased IRA activity in England in 1988, including the addition of a police guard post and security gates at the end of the street. Plans to leave a car bomb on a street near Downing Street and detonate it by remote control as Thatcher's official car was driving by had been ruled out by the IRA's Army Council owing to the likelihood of civilian casualties, which some Army Council members argued would have been politically counter-productive. The Army Council instead sanctioned a mortar attack on Downing Street and in mid-1990, two IRA members travelled to London to plan the attack. One of the IRA members was knowledgeable about the trajectory of mortars and the other, from the IRA's Belfast Brigade, was familiar with their manufacture. An active service unit bought a Ford Transit van and rented a garage and an IRA co-ordinator procured the explosives and materials needed to make the mortars. The IRA unit began making the mortars and cutting a hole in the roof of the van for the mortars to be fired through. 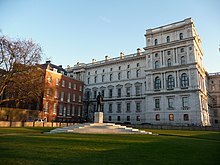 They reconnoitred locations in Whitehall to find a suitable place from which the mortars could be fired at the back of 10 Downing Street, the Prime Minister's official residence and office. Once preparations were complete, the two IRA members returned to Ireland, as the IRA leadership considered them valuable personnel and did not wish to risk them being arrested in any follow-up operation by the security services. In November 1990, Margaret Thatcher unexpectedly resigned from office, but the Army Council decided the planned attack should still go ahead, targeting her successor John Major. The IRA planned to attack when Major and his ministers were likely to be meeting at Downing Street and waited until the date of a planned cabinet meeting was publicly known. On arrival, the driver parked the van and left the scene on a waiting motorcycle. Several minutes later at 10:08 am, as a policeman was walking towards the van to investigate it, three mortar shells were launched, followed by the explosion of a pre-set incendiary device. This device was designed to destroy any forensic evidence and set the van on fire. Each shell was four and a half feet long, weighed 140 pounds (60 kg), and carried a 40 pounds (20 kg) payload of the plastic explosive Semtex. The weapon was described as a Mark 10 homemade mortar. Two shells landed on Mountbatten Green, a grassed area near the Foreign and Commonwealth Office. One exploded and the other failed to detonate. The third shell exploded in the back garden of 10 Downing Street, 30 yards (27 m) from the office where the cabinet were meeting. Had the shell struck 10 Downing Street itself, it is likely the entire cabinet would have been killed. On hearing the explosion, the cabinet ducked under the table for cover. Bomb-proof netting on the windows of the cabinet office muffled the force of the explosion, which scorched the back wall of the building, smashed windows and made a crater several feet deep in the garden. Immediately after the attack, hundreds of police officers sealed off the government district, from the Houses of Parliament to Trafalgar Square. Until 6 pm, civilians were kept out of the area as forensic experts combed the streets and government employees were locked in behind security gates. ^ The assassination attempt targeted the entire Cabinet at 10 Downing Street (as well as the Prime Minister). ^ a b Harnden, Toby (1999). Bandit Country. Hodder & Stoughton. pp. 21–35. ISBN 0-340-71736-X. ^ a b c d e f Taylor, Peter (2001). Brits. Bloomsbury Publishing. pp. 317–318. ISBN 0-7475-5806-X. ^ a b c d e f g h i j Dillon, Martin (1996). 25 Years of Terror: The IRA's war against the British. Bantam Books. pp. 266–270. ISBN 0-553-40773-2. ^ Geraghty, Tony (2000). The Irish War: The Hidden Conflict Between the IRA and British Intelligence. HarperCollins. p. 193. ISBN 978-0-00-638674-2. ^ a b c d Bowyer Bell, J. (1993). The Irish Troubles: A Generation of Violence 1967–1992. Gill & Macmillan. pp. 784–786. ISBN 0-7171-2201-8. ^ "Man held after Downing St hammer attack". The Daily Telegraph. 10 September 2004. Retrieved 15 May 2009. ^ a b c d e f Bowyer Bell, J. (1997). The Secret Army: The IRA. Transaction Publishers. pp. 623–625. ISBN 1-56000-901-2. ^ Major, John (2000). John Major. HarperCollins. p. 238. ISBN 978-0-00-653074-9. ^ a b c d e Craig R. Whitney (8 February 1991). "I.R.A. Attacks 10 Downing Street With Mortar Fire as Cabinet Meets". The New York Times. Retrieved 15 May 2009. ^ a b c d e Taylor, Peter (1997). Provos: The IRA & Sinn Féin. Bloomsbury Publishing. pp. 321–322. ISBN 0-7475-3818-2. ^ McGladdery, Gary (2006). The Provisional IRA in England: The Bombing Campaign 1973–1997. Irish Academic Press. p. 150. ISBN 978-0-7165-3374-0. ^ a b c d e Stephen Cook and Michael White (8 February 1991). "IRA shells the War Cabinet". The Guardian. Retrieved 15 May 2009. ^ "'I think we had better start again somewhere else'". The Guardian. 8 February 1991. Retrieved 9 June 2015. ^ English, Richard (2003). Armed Struggle: The History of the IRA. Pan Books. p. 274. ISBN 0-330-49388-4. ^ Bandit Country, p. 337.